We are presenting to you one of the Most exciting Health products, thanks to contribution by Yogis & Siddhas of Ancient India, to the mankind. Walking over this 8 shaped Mat in the shape of 8 for 15/30 minutes in the morning and evening is said to be atleast 4 times more beneficial than a normal walking exercise and showers enormous and amazing health benefits as reported by the beneficiaries, few of which are listed below. Besides, this Mat is Scalar Energized, which helps to keep the body in the most desirable frequencywhen walking over this Mat. The Mat measures 10 ft x 5 ft and is spread on the floor, inside the house or in open.Yogis have identified that 8 shaped walking helps to favorably impact various organs including Pancreas, resulting in a host of health benefits. 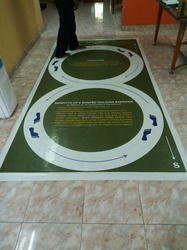 8 shaped walking over this Mat very effectively addresses problems related to Insomnia, nose blocks,Sinus, Asthma, Head ache, Migraine, Thyroid, OBESITY, Unwanted Fat, Knee pain, Rheumatoid Arthritis, Constipation, Neck, back, lumbar, Spondylitis, Depression, Nervous debility, SUGAR LEVELS, BLOOD PRESSURE,Heart Problems and many more health imbalances. Buyers from outside INDIA can check with us for the prices including courier charges. Looking for 8 SHAPED EXERCISING MAT ?